China has big plans for cars—and other related markets. After years of trailing behind Japanese, European and U.S.-based carmakers in automotive technology, reliability, status, and even market share within its own political borders, the country is making a concerted push into internally developed and manufactured assisted- and self-driving vehicles. The strategy plays out well for China on multiple fronts. It directly addresses a portion of China’s trade deficit, which in semiconductors currently amounts to about $150 billion a year. It also transforms China from a major polluter into a global leader in clean energy, because the plan is to roll out this effort using fully electric vehicles. And it opens up a potentially lucrative opportunity an established global industry where the country has achieved only second- or third-tier status. Fig. 1: 2016 Worldwide rankings of carmakers by vehicles produced. Source: Wikipedia. 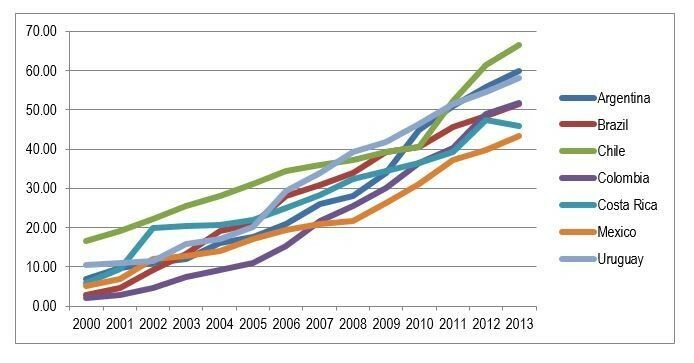 China’s record in semiconductors, in particular, has been spotty at best. Despite massive investments, its memory business has never taken off and its foundry success has been limited, particularly for non-domestic customers. Failing to win significant market share with its internal development, it then attempted to buy up established U.S.-based companies such as Lattice and Micron, but its efforts were blocked by the Committee on Foreign Investment in the United States (CFIUS). Failing on that front, the Chinese government established an investment fund in conjunction with local governments and state-owned “private” businesses to jump-start an indigenous chip industry. Estimates for this fund range from $100 billion to $150 billion, some of which has been used to build new fabs inside of China. There are anywhere between 14 and 22 new fab projects underway, some domestic and some involving multinational chipmakers. But the jury is still out on how successful China will be in any of these areas. The fundamental problem is that many of those efforts are aimed at existing markets, and it is extremely difficult to dislodge entrenched players without at least an order of magnitude improvement in cost, power or performance. In semiconductors, that typically involves investments of tens of billions of dollars using the latest process technology, which is extremely difficult to master. Most of the big foundries already are working on 5nm and 3nm. As a point of reference, it took ASML nearly two decades to get EUV lithography out the door. Assisted-driving and autonomous driving, in contrast, represents a discontinuity. 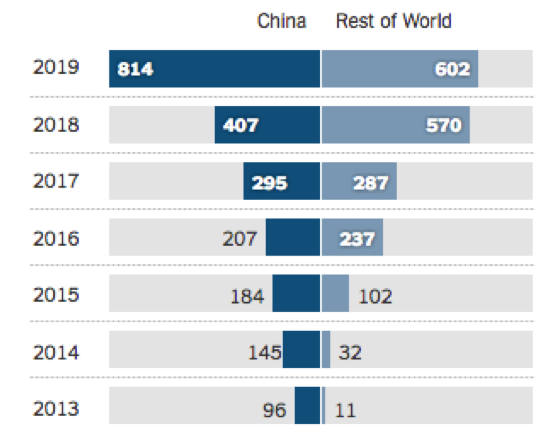 So far, no one has an advantage in this segment, and China is vying to become a prominent player here using all-electric vehicles as a platform. Fig. 2: Number of electric cars, in thousands. Source: LMC Automotive. China has deep industry knowledge here, as well. The country is the largest producer of automobiles in the world today. But most of that production involves multinational companies that have set up joint ventures in China to take advantage of lower labor costs and a huge internal market. 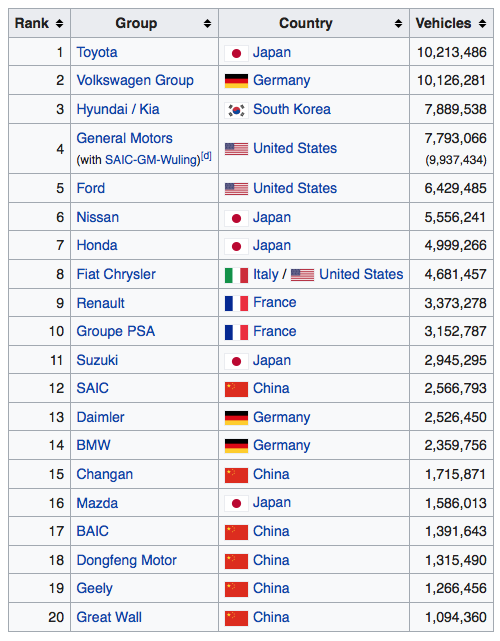 None of the world’s top 10 automakers is Chinese. That could change quickly, and it subsequently could have a big impact on the country’s semiconductor business. Electric cars help alleviate another big issue for China, namely air pollution. Air quality in Shanghai and Beijing, while not the worst on the planet, made the World Health Organization’s 2016 list of the most polluted cities with more than 14 million inhabitants. Shijiazhuang, capital of Hibei province in northern China, is even more polluted, ranking 13th for the most polluted cities of any size, according to WHO. Car exhaust is an obvious contributing factor in pollution, but for many countries it is an expensive one to fix because it requires replacing existing cars with those powered by electricity or hydrogen. Even China has found it difficult to make progress here. In September, the government pushed out its zero emission vehicle quota by a year, which originally was supposed to mandate that 8% all car sales be zero-emission by 2018. The government is sticking to the plan to increase that number to 10% by 2019, however, and 12% by 2020. Current speculation by multiple sources is that by 2040, all gasoline engines will be phased out. The other big contributor to pollution is fossil-fuel power plants, primarily coal, which today account for 57% of the country’s electricity. China is in the process of building 20 new nuclear power plants, according to the World Nuclear Association. That would increase its nuclear capacity by 70% to 58 gigawatts over the next four years. It plans to increase that number to 150 gigawatts by 2030, and even higher by 2050, the group said. China also is designing floating nuclear reactors to power offshore rigs and islands. This is just one facet of China’s plan to clean up the environment, too. In September, it announced that it would revoke more than 1,000 iron ore mining licenses due to pollution concerns. That represents about a third of all iron mines in the country. Most of the iron ore in China is low grade, and small mining operations have not had the capital to invest in more environmentally friendly methods and equipment. Electric vehicles are a stepping stone to the next big market opportunity. Assisted and autonomous driving are the next big thing in cars, and China is gearing up for this race in a big way alongside the rest of the automotive industry. But China also has a political infrastructure that can set standards unilaterally and quickly, which can greatly improve its ability to get new technologies to market faster than some of its rivals. This eliminates some of the main issues with autonomous vehicles, which is largely backward compatibility with existing cars on the road. China may have more than one approach, as well, due to uneven levels of infrastructure development throughout the country. One of the big problems with autonomous vehicles is they have difficulty making turns when pedestrians are present. They can understand traffic signals and road signs. They can even identify a person versus an animal. But when people are entering a crosswalk, an autonomous vehicle will wait indefinitely until there are no people moving. “China has the ability to put a bunch of cars on a closed track and keep out the people,” said ArterisIP’s Janac. That may just be a starting point, too. The big question is how else China can leverage this technology. The country’s One Belt, One Road concept revolves around a huge infrastructure shift that will extend across entire continents. Green-field designs are much quicker to implement than trying to retrofit new technology to work with existing infrastructure. In the 1990s, Latin America was viewed as a communications backwater because it was difficult to install telephone lines across mountainous terrain and rainforests. That perception changed dramatically with the introduction of cell phones. Today, more than than 60% of the population in Latin America is connected to the Internet, with much of the infrastructure wireless. Likewise, cellular infrastructure in the United States was years behind other countries until the past decade with the widespread rollout of smart phones. Autonomous vehicles will likely follow a similar pattern, showing up first in less populated areas or in areas—such as cross-country trucking to large depots outside of major cities—or wherever there is no existing infrastructure. China consumes an estimated 45% of all semiconductors produced around the globe, according to SEMI. The assisted and autonomous automotive market is a way of making sure that more of that content is developed and stays within China, and eventually the government has plans to export much of that technology, according to multiple industry sources. Almost everyone who follows the automotive industry closely believes China is using autonomous vehicles as a stepping stone to become a major player in this market. After decades of trying to break into semiconductors, China finally appears to have found an inflection point that it can leverage. And from here the country’s technology industry is expected to move very quickly to carve out market share and new markets. China’s policy may have big implications for semiconductors and IP. China holds vast potential market opportunities, but presents challenges to the US semiconductor industry. For suppliers, it would be easier to focus on electrification than on autonomy. All the semi giants are racing for a stake in autonomy but the world underestimates the ramp for electric cars and there is a lot of content there. It’s easier money as most aren’t seeing this coming yet. The electric powertrain already offers better value than ICE, folks look at costs or TCO but they should look at value and how to market that value as there are many advantages offered by the powertrain. Much faster charging and awareness are solvable issues while costs will come down, that’s a given. We are a few years away from the moment when almost everybody has taken a ride in an electric car, a few years away from the moment when most consumers begin to know in what ways electric cars are better. Buyers will know about instant torque, lower vibration and noise, smoother ride, no fumes, much cheaper fuel, higher reliability, more freedom in managing the mechanical volume (cooler designs, larger cabin and so on), ability to charge at home. Car as a service accelerates the ramp ofc. You got ,even today, studies claiming a slow ramp for electric vehicles and many are happy to accept such conclusion but ICE is over, it’s outdated technology. Anyway, everybody is focused on autonomy and investing heavily but most are far too cautious on electrification and that’s a big opportunity for those that bet on it.